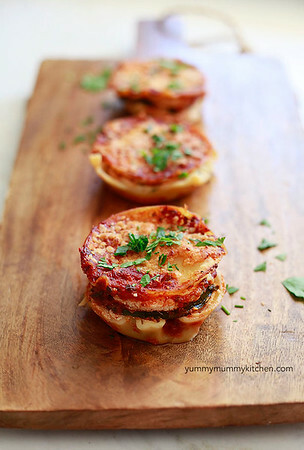 I was looking for a new meatless meal to try when I came across Yummy Mummy Kitchen's Lasanga Cupcakes and was intrigued! (her picture above) I did one tray as she directed and one with only veggies and no noodles and they were sooo yummy! Easy to put together, easy to clean up and super easy to devour. I wanted to be sure to save this recipe because I will definitely be making them again! Original recipe, with more pretty pictures, HERE. Cook noodles according to package instructions. Set on a lightly oiled cookie sheet so that the sheets don’t stick together. In a medium bowl, stir together the ricotta, Parmesan, egg, and basil until well combined. Set aside. Spoon tomato sauce into 12 muffin cups to coat the bottom. Cut cooked lasagna sheets into 2-inch pieces, or 2-inch rounds if you have a cookie cutter. Place one piece of lasagna noodle in each cup over the sauce. Top with 1 tablespoon of ricotta mixture. Top ricotta with one slice of zucchini, mozzarella, and eggplant and press gently into the ricotta. Cover vegetables with a layer of tomato sauce. Top with a teaspoon of the ricotta mixture. Cover ricotta with a second sheet of pasta, then spread tomato sauce over the top. Sprinkle with Parmesan. You may have enough ingredients left over to make about 5 more, so go ahead and do so in a second muffin tin! Bake at 375 degrees F for 35 minutes. Let cool 10 minutes. Run a knife around the edge to release cups.